Put the video in a second frame for logo into the sequence frame, at the same time prepare the HD IP camera storage and playback sequence, divide the different sequence frames several file HD IP camera storage; Single frame sequence file can be played, the effect is equal to record low stream video effect. All frames used to synthesize completely video playing together, is a high definition or standard definition video effect. When it is needed to recycle the HD IP camera storage space, according to HD IP camera storage strategy planning, part of the first sequence frame area cover the video file. Another part is preserved, thus more efficient use of HD IP camera storage space. For example, according to the original HD IP camera storage capacity can keep 1 month of video data, after the distribution of the video frame file HD IP camera storage, can keep several months of selective sequence data frames of video files. To have retained the long-term sequence frame video file for part of the cover, realizes the fading type video gradually discarded, long-term retention of video data is not completely disappear, but slowly disappear, and discarded. To maximize the extension of the surveillance video time reserved. In general, limit the biggest factor is the accuracy problems of the application of intelligent analysis technology. So the development trend of intelligent analysis technology application must be in the direction of improving accuracy. At the same time, on the other hand, you will find some don't care about the accuracy, and pay more attention to the efficiency of some application directions. Coaxial cable is widely used in connection for almost all analog video surveillance systems. Similar to other low-end products, almost all coaxial cable are made-in-china, these coaxial cables are compliant with Chinese standard: GB/T14864-93. 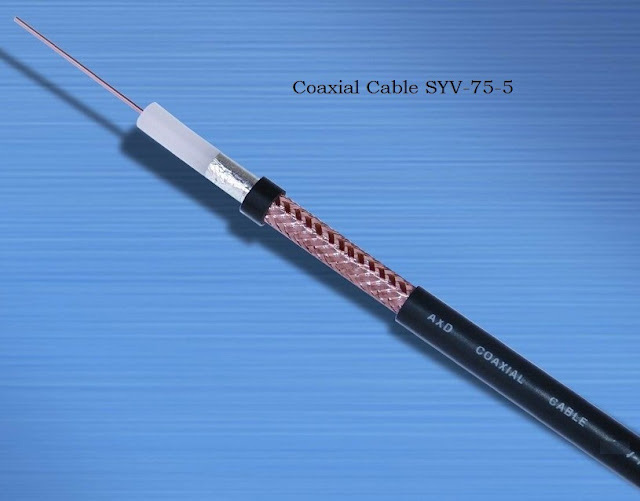 In order to buy coaxial cable with correct specification, you may want to know the difference between SYV-75-3 and SYV-75-5. SYV means Solid polyethylene (PE) insulated coaxial cable, 75 means impedance value, the following 3, 5, 7, 9, 12 stands for its insulation outer diameter (respectively 3mm, 5mm, 7mm, 9mm, 12mm). In other countries, coaxial cable use RG ratings to distinguish between the different kinds of cables. RG59 coaxial cable is the ideal choice for analog video surveillance system. 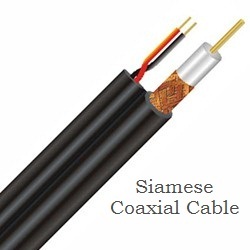 Furthermore, for easy video surveillance installation, people can choose Siamese coaxial cable which consists of a RG59 cable merged together with a 2C power cable. Through using Siamese coaxial cable you can run the power and video signal for your security cameras simultaneously, which in turn, greatly reduce installation time and cost. Generally, RG59 equals to SYV-75-5. Video surveillance users who opt for an NVR using an embedded, dedicated Linux operating system within a self-contained unit will benefit from performance which is superior to that offered by a Windows-based NVR in terms of ease of use, system stability and decoding capability. Embedded NVRs are distinguished from WINDOWS-based NVRs primarily on how they operate and the features they provide. The stand-alone NVR comes in a single, compact enclosure. By contrast, a WINDOWS-based NVR is a peripheral addition to a system involving a CPU, keyboard and monitor. In confined locations, an embedded unit performs a similar if not wider range of functions while occupying less space. Embedded NVRs have overcome their perceived shortcomings in terms of storage capacity and types of storage medium through use of devices including IP-SAN, eSATA, NAS (network-attached storage) and Fire wire. Furthermore, embedded NVRs can support interfaces to other surveillance devices which can be conveniently integrated with alarm systems and access control systems as well as PTZ remote control systems. Some common functions between the two video recording solutions in the surveillance market, it will be useful to list the core functions that are common to both approaches. These include: recording; archiving; display; playback; search on parameters such as date, timeline and event; camera management; triggered recording on prescribed events and export to removable media. NVRs are also usually expected to be able to handle VoIP packets. Once digitalized video has been streamed, end-users expect to be able to treat it like any other network data, viewing it locally, on LANs and remotely from web browsers. They also expect to be able to exercise PTZ control over cameras remotely, configure settings and even perform upgrades remotely. The precise architecture of the embedded NVR units makes them less prone to crash. However, the WINDOWS methodology for NVRs is certainly 'open' in terms of the addition of external storage, installation of software etc. The controls are embedded into the NVR; they are an integral part of the panel rather than an adjunct, and the activity of operators can therefore be more easily restricted to legitimate usage. Unlike a WINDOWS-based unit which is likely to run a range of Windows™ applications, an embedded NVR benefits from the stability that comes with Linux code which is optimized to run only applications relevant to the surveillance tasks required. An embedded operating system contains only the software components necessary for the specific functions of the NVR, and the unit will be supplied with optimum configurations straight from the factory after rigorous testing. An NVR is designed to offer optimal performance for a set number of cameras, and is normally less scalable than a WINDOWS -based system. This makes the unit suitable for smaller systems where the number of cameras stays within the limits of an NVR’s designed capacity. The NVR runs an embedded operating system as compared to a WINDOWS -based system, which needs to run an application under the Windows OS before it begins recording. This means that the NVR will start faster as compared to the WINDOWS -based system; which will take longer to load. Embedded NVRs consistently outperform WINDOWS-based solutions in their ability not only to perform complex decoding but also to give the user reliable video playback and preview. Currently, certain NVRs are among the few units which can perform both local decoding and playback, with decoding of up to 16 channels at 1080p being achievable. The processing demands made on a WINDOWS-based solution to achieve comparable performance are far higher than those required of an embedded device, and necessitate powerful, expensive CPUs. Embedded technologies are helping the surveillance industry to go green in marked contrast with the WINDOWS approach. The power consumption of an embedded NVR is approximately 70W which is less than an incandescent light bulb. By contrast, the likely power consumption of a WINDOWS capable of running an NVR is approximately 200 watts and together with a large enterprise-grade monitor, the total figure will be about 300 watts. For any end-user mindful of their carbon footprint, these figures alone must do much to settle the debate. Embedded NVRs can have operating panels based on the very best intuitive design principles. LED signals, digital inputs and outputs, push buttons and dials can all be arranged in an ergonomic way. Sensible layout in a panel approach rather than a screen-based GUI can replicate the ease of use found in a WINDOWS but without the vulnerabilities described above. Linux based Network Video Recorder for multi-brand and ONVIF compliant multi-megapixel IP cameras and basic automation. The network HD features video bu­ffer technology and the delay is controlled within 300 milliseconds in the general and fair networking environment; However, HDCVI features no latency capability for an outstanding real-time performance. For HDCVI, there is no compression processed to maintain its original e­ect and thus present in vivid image quality. As HDCVI transmits multiple-signal (video/audio and dual-way data) over one cable, it realizes video/audio synchronized transmission and reverse-signal transmission control at the same time, such as PTZ and zoom control; which further simpli‑es the installation.